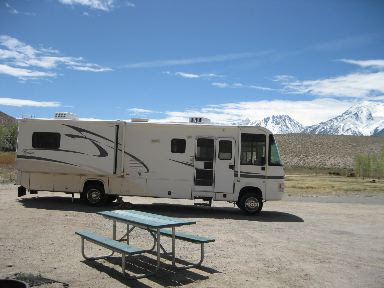 As I mentioned in my last post, I really liked the Bishop area, when my time was up at Brown's Town I just couldn't move on so I moved 6 miles out of Bishop to Pleasant Valley Campground which is a County dispersed type campground with no hook-ups along the Owens River. I have to say that the sound of the river flow, the raptors soaring by as they hunted along the river and the mountain views made for a very 'pleasant' stay. 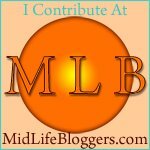 I saw deer, osprey, hawks, water birds and more on my walks along the river trails with Dog, who was happy to hunt critters in the brush. I thought I'd stop a night but stayed 5. There is a reservoir a short distance down the road where you can park and then walk down to. There were plenty of folks fishing but it lacked a lot of vegetation and wasn't near as peaceful the trails along the river itself, so Dog & I opted to do our playing along the river. There is BLM camping up the hill from this Valley. It is called "The Pleasant Valley Pit" and costs $2 per night. 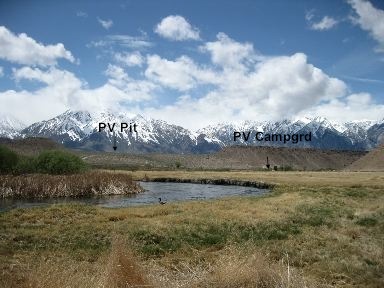 The PV Pit is on top of a plateau with a pit area. My phone worked better there and the mountain views were nice but being next to the river seemed more peaceful. The Pleasant Valley CG fees are $10 per night. There is at least one site big enough for any size rig. I would have loved to have stayed longer but wind warnings were again being issued and I wanted to get a bit further up Hwy 395 before the wind hit. BISHOP! A Great place to stop & play. It is less than 60 miles from Lone Pine, CA to Bishop, CA but I would have liked to stop and explore for a couple of days in between the two. 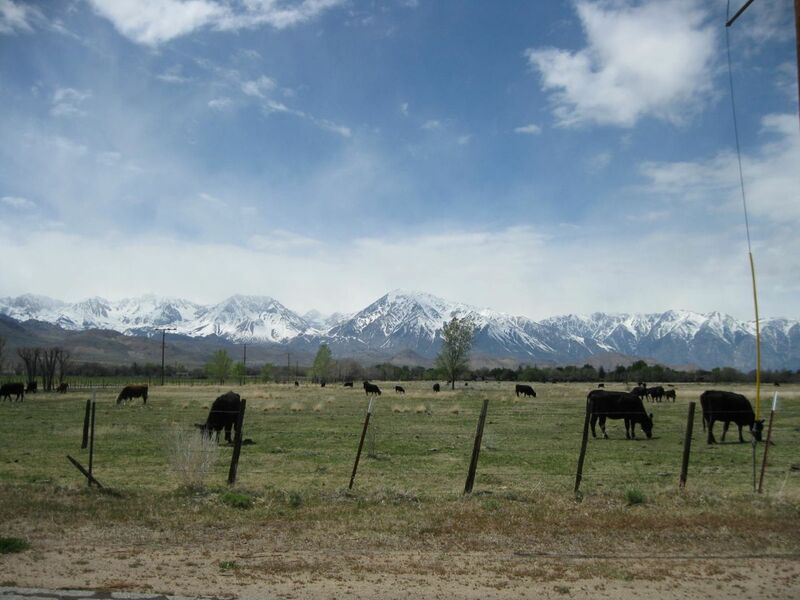 There seems to be no lack of things to see along Hwy 395 in California. There are books written about this route and I am certainly starting to understand why. I was again traveling in between wind storms, so I didn’t stop this time. I liked Bishop as soon as I drove through it. It’s a small town, with mountains on 3 sides. It still has horses and cattle within its boundaries and ATV and Kayak rentals available on Main Street. The only box stores are the Kmart and the Von’s .. Not even a Walmart. You can buy fishing lures and supplies at the Grocery store. There are still plenty of chain stores here, tucked in amongst the independent restaurants and stores, but it so nice to be some place that box stores don’t rule. It reminds me of what, Montrose, Colorado might have been like 20 years ago. The roads that go up into the mountains and to the nearby lakes were still closed due to snow, so playing in the mountains wasn’t an option. The Owens river, however was flowing well and fishing season was just getting ready to start. The Erik Schatts bakery, “Home of the Original Sheepherders Bread”, was baking up a storm as well. 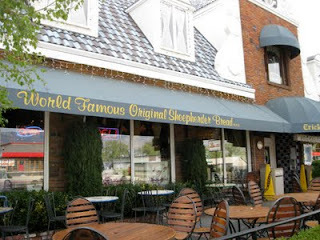 It is a great bakery, with all kinds of breads, they make sandwiches and have gelato as well. 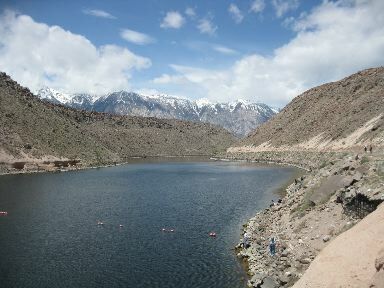 Definitely, a place to visit while in Bishop. I spent several days the Brown’s Town RV park, enjoyed the town and sat out a couple of wind storms. 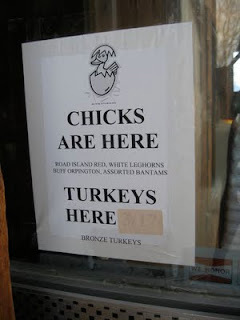 I was able to find the RV supplies I needed at the Feed Store, where they were also selling newly hatched chicks. (Something, being a suburbanite, you don’t see often or ever.) I really really really like the feel and size of this town and all the recreation within close proximity. I would have loved to stay the month but Brown’s Town has a 14 day stay limit and no price breaks for longer stays. 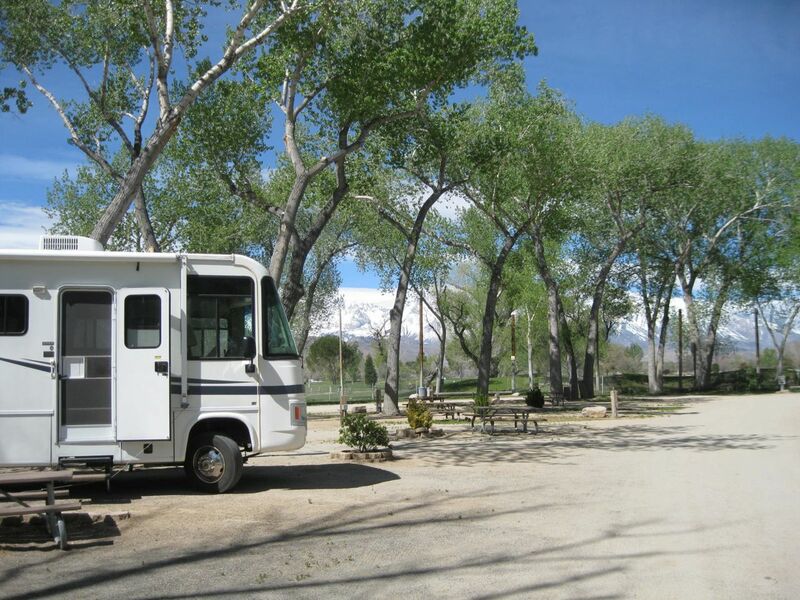 Brown’s Town Rv spaces were a bit tight but I liked this park better than the other options in town.